Utah County changes course again. It will mail ballots to voters for this year’s election after threatening to revert to in-person voting. (Al Hartmann | The Salt Lake Tribune) Utah County Commission Chair Bill Lee, center, and Commissioner Nathan Ivy hold a commission meeting Tuesday Dec. 12 in Provo. Missing in chair at left was Commission Vice-Chair Greg Graves. Graves participated by teleconference. This was the first Utah County Commission meeting following the release of a sexual harassment complaint and investigation that showed many county employees feel Commissioner Greg Graves is considered a bully with explosive behavior who retaliated against an employee. Several people have called for his resignation. Utah County backed off its plan to save money by reverting to a largely in-person voting system this election after outcry from local city officials who wanted the county to continue relying on the popular vote-by-mail process. 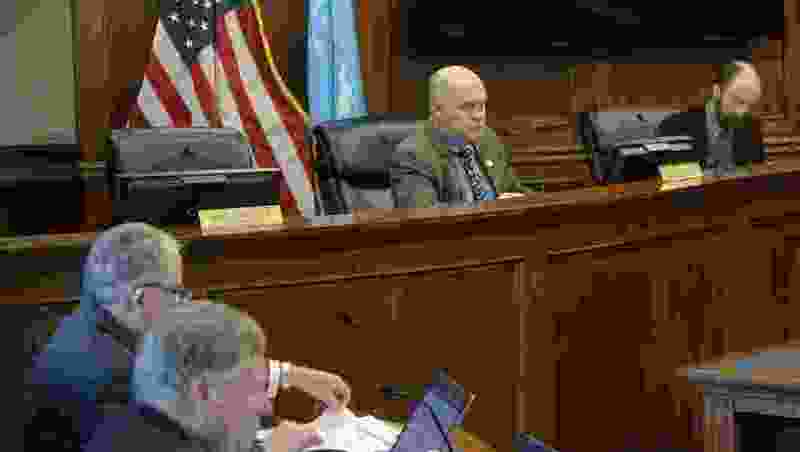 County commissioners held a news conference Thursday where they said they’d make adjustments that would allow Clerk/Auditor Bryan Thompson to continue mail-in voting that’s largely replaced in-person voting across Utah, Thompson said. The county planned only to mail ballots to those who specifically requested them this year, a change from the 2017 election and a method that’s used widely throughout Utah and elsewhere in the country. “They made a decision as the commission to go ahead and do what’s necessary to even in this cycle fund vote by mail,” Thompson said. “Essentially, it will be the same as it was in 2017, which was all by-mail” plus voting centers where residents can submit ballots or vote in person, Thompson said. A recent election law change actually requires counties to offer voting centers for at least four days to make sure anyone who wants to cast a ballot in person can do so. The past election didn’t run too smoothly for Utah County or Thompson, who sent Republican primary ballots to 68,000 independent voters by mistake. County commissioners assured voters there would be no more errors this time around. “Despite the initial challenges that will come with a vote by mail process, the clerk/auditor’s team will successfully transition and run an error-free election,” the commissioners said in a news release. The county was concerned it wouldn’t have the staffing or resources to handle the extra ballots that are expected from the midterm election. Staff or contractors in mail-in vote counties have to open envelopes and verify signatures. Despite the hiccups, the process has proven to be popular with voters, and turnout was higher in vote-by-mail counties than those that didn’t adopt the practice.